Selected poets were invited to send us a Picture Postcard from the town or place where they live, work or just somewhere they had visited, in April 2013. On the reverse side of the postcard, adjacent to the address panel, where normally there would be a message, the poets were requested to hand write an original poem ‘that related in some way to the location of the postcard’. In essence, there were few rules and no further guidance given. The length of the poems is determined by what can legibly be written on the left hand side of a standard picture postcard, with content relating to place, time, location or simply the fact that it was written there, at that time. The idea was to create an exhibition which is very much of the moment, a snapshot of time and place, in the spirit of a ‘spoken message’. 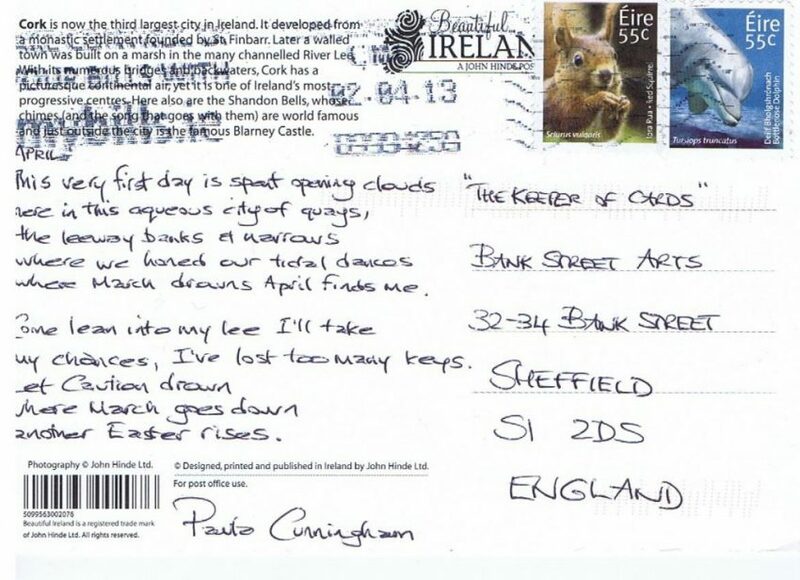 The Postcards were exhibited during the 2013 Sheffield Poetry Festival. The Poets taking part were Catherine Benson, Gerard Benson, Peter Carpenter, Paula Cunningham, Amanda Dalton, Ian Duhig, Yvonne Green, Harry Guest, Geoff Hattersley, Michael Laskey, John Lyons, Kim Moore, Blake Morrison, Andrew Motion, Jean Rees-Lyons, Ed Reiss, Mark Roper, Penelope Shuttle, Catherine Smith, Jean Sprackland, Matthew Sweeney, Pam Thompson and Jackie Wills. For the 2014 MidSummer Festival, the same poets were asked to send out an invitation to poets of their choice to participate in an enlarged version of that show for this year’s event. This year we have new work by Liz Almond, Clare Best, Anne Caldwell, Peter Carpenter, Sally Flint, Kerry Hardie, James Harpur , Alan Jenkins, Lydia Kennaway, John McCullough, Michael McKimm, Katrina Naomi, Lawrence Sail, Imogen Sol and Lorna Thorpe, which will be shown alongside the original Postcard Poems.